Update. A Google team, working under SVP Urs Hölzle of WWF, refused to implement a feature improving Google Cloud security necessary to bid on military contracts (according to Bloomberg). Earlier, Google announced it would not work with the US military on Artificial Intelligence projects. But this feature is not related to AI. Thus, Google refuses to aid the US military at all. Meanwhile, Google services (including Google Maps and Google AI) are available to terrorist organizations and hostile armed forces worldwide. 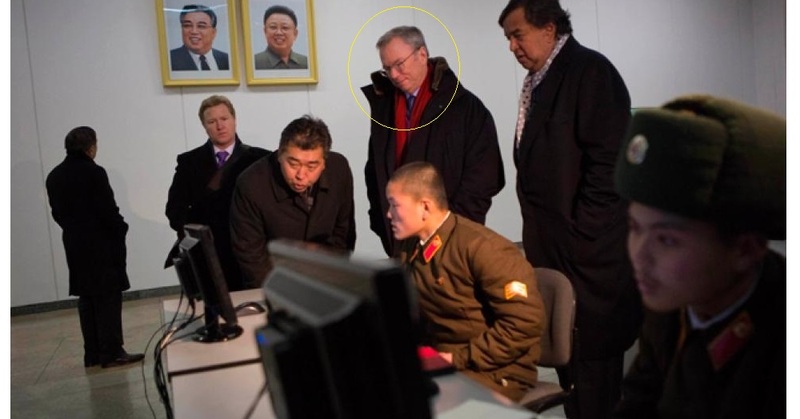 In 2013, Google’s Chairman Eric Schmidt visited North Korea where he aided the North Korean military. Since early 2017, Google has been putting its weight behind the conspiracy theory alleging Trump – Russia collusion before 2016 elections. Apparently, Google also prevented its engineers from publicly debunking the internet related “evidence” of this “Russian collusion” fiction. Facebook, Twitter, Apple, and other “Masters of the Universe” seem to join forces with Google in supporting this conspiracy theory and denying information and expertise to the public and security agencies. It seems Google and its accomplices also intimidate professionals across the industry into silence. There is no other explanation as to why none of about four million US software/network engineers has publicly and widely debunked the conspiracy claims. The Big Tech leadership is a close-knit community. Colluding is like breathing for its members. After it was revealed that Google, Apple, Intel and few other companies had made verbal agreements to reduce competition in hiring, the perpetrator settled for about $400M — a slap on the wrist. These verbal pacts became known as “no poach” agreements, although they included other restrictions on competition. Participants in these illegal agreements made and exchanged lists of “do not call” employees. It’s easy to imagine them maintaining blacklists of employees and managers who express conservative views or support Trump. Even if Big Tech companies do not maintain such blacklists, they listen to the far left groups who do. Almost all smaller tech companies face fierce competition and critically depend on Google, Facebook, or Apple, and sometimes on all three of them. These behemoths make no secret of their extreme anti-conservative and anti-Trump stance, and are known to act in accordance. Thus, even a small tech company is likely not to hire an engineer or manager if it thinks that Google, Facebook, or Apple might be hostile to him or her. Original post from October 30, corrected on December 11, 2017. The fake-stream media is trying to resuscitate the conspiracy theory of the Trump-Russia collusion with headlines like “Google Identifies Russian Election Interference on Network” (1), only to admit that Google had identified only $4,700 in suspicious ad buys. The Senate Intelligence Committee seems to be eager to swallow this nothing-burger. I would be more interested in substantial meddling by foreign powers (including NGOs), almost all of which benefited the Democrats. Ever heard of Marshall Institute? That was a small group of big scientists that stood for anti-missile defense and against climate alarmism on a budget of less than a million dollars. In its search results, Google actively pushes libel against its living members, such as Professor Will Happer. Not surprisingly, Eric Schmidt’s “charitable” foundation 11th Hour promotes the same libel using the power of hundreds millions of dollars. Google also participates in #resistance, funds and supports borderline treasonous activities in the US (no kidding), and so on … I have a feeling that nobody cares and that bothers me. By the way, my latest article How Google and MSM Use “Fact Checkers” to Flood Us with Fake Claims has been published by WUWT today.